In horses, Pinto is not a breed, but a description of coloration. In cars, the Pinto is colored by a history of corporate malfeasance and an era of performance malaise. Still, Nice Price or Crack Pipe keeps an open mind. Yesterday 87% of you said how swede it is over the tidy little 99. That Saab possessed an economical four cylinder and many innovative and thoughtful features which continue to this day to delight with their idiosyncratic delivery of driving enjoyment. In comparison to that car's high-carbon steel surgical blade approach to carving up the miles, today's candidate is a hand-cleaved stone axe to the crotch. 1979 Saab 99 GL for a Rally-Winning $3,995! Pintos. given their sordid history, joining the owner's club may not high on your to-do list. But people do love them, much in the way they love a good bowel movement, or in the way a cat takes pride in the decapitation of a cheery songbird. These achievements may provide personal gratification, but lack the exigency of community to make them a shared victory. 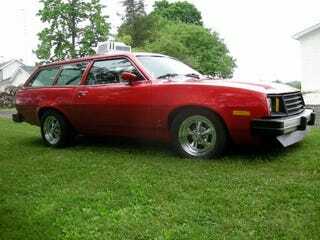 Still, there is a dedicated collective of like-mined souls, which is the Pinto Owner's Club, and that's where you'll find this 1980 wagon, and its 5.0 motor. Ford's littlest pony was the basis for the lamented Mustang II, and at some point in the gestation of the platform a Ford engineer realized that someday they might want to shove something bigger than the Cologne V6 in there. That makes four-banger Pinto owners slap their foreheads globally and exclaim I coulda' had a V8! just like this owner did. He dropped in a former Mustang motivator, backup up by an AOD 4-speed slusher, for a pinto with picante. The '93 5.0 is good for a healthy 205 bhp out of the crate (remember that '93 was the year the output of the 302 went down by 20) and that more than double the horsepower over the Lima 2.3 means that this is a horse of a different color. Speaking of color, that arrest me red might not have been the best choice for the street as radar gun-slinging smokies will be on it like it's doughnut-encrusted. On the strip, that bright red paint will let you pick out the car amongst all the burn-out that the 9" rear end transmits to both back tires for distribution. Cragar mags; Corbeau seats; this car lacks only the 8-track of Dennis Wilson's Pacific Ocean Blue to register a 7.0 on the disco era richter scale. It's got a roll cage, reassuring as the car it likely a tree magnet, and the wagon body is still pretty good looking to this day. So, $4,500 to put the pinto to the metal. Is that a Price that's Nice for a pony with some ponies? Or does its basic pintoness make you think the seller is Cracking the Pipe over this one? Fordpinto.com or go here if the ad disappears.